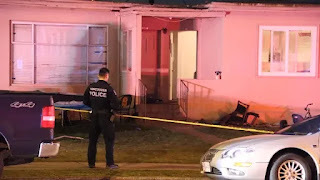 CTV is reporting that "A 69-year-old man was shot dead on the doorstep of a home he shared with three generations of his family, including five children, one as young as two years old, neighbours say. Zenen Cepeda Silva was killed just after midnight on Fraser Street just south of 51st Avenue Sunday. His horrified wife and some of his children stayed in the house next door while police combed the lawn for evidence and dusted for prints." CTV is reporting that "A man in his 50s has been charged with first-degree murder in connection with a shooting in East Vancouver. Police announced the arrest of Alvaro Julio Roche-Garcia on Tuesday, three days after a grandfather was shot dead outside his family home. The 58-year-old suspect remains in custody, officers said."